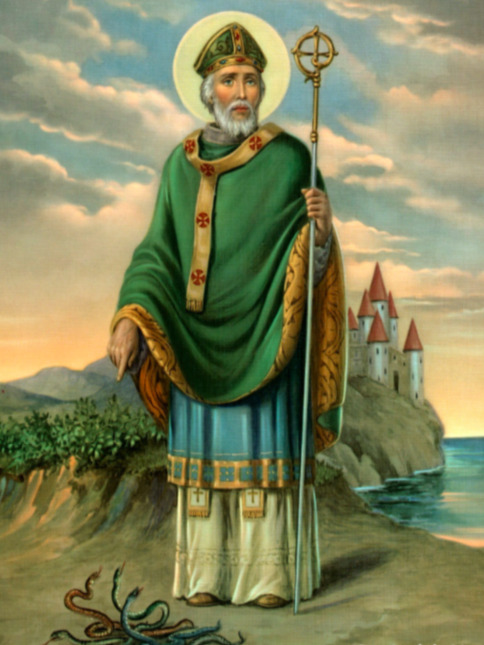 Patrick of Ireland was a younger contemporary of Augustine of Hippo and Martin of Tours—the fifth century heroes of the faith who laid the foundations for the great civilization of Christendom. He was apparently born into a patrician Roman family in one of the little Christian towns near present day Glasgow—either Bonavern or Belhaven. Although his pious parents, Calphurnius and Conchessa, nurtured him in the Christian faith, he later confessed that he much preferred the passing pleasures of sin. One day while playing by the sea as a teen, marauding pirates captured Patrick and sold him into slavery to a petty Celtic tribal king, named Milchu. During the next six years of captivity he suffered great adversity, hunger, nakedness, loneliness, and sorrow while tending his master’s flocks in the valley of the Braid and on the slopes of the Slemish. Amazingly, Patrick came to love the very people who humiliated him, abused him, and taunted him. He yearned for them to know the blessed peace he had found in the Gospel of Christ. Eventually rescued through a remarkable turn of events, Patrick returned to his family in Britain. But his heart increasingly dwelt upon the fierce Celtic peoples he had come to know so well. He was stunned to realize that he actually longed to return to Ireland and share the Gospel with them. Though his parents were grieved to see him leave home once again, they reluctantly supported his efforts to gain theological training on the continent. His classical education had been interrupted by his captivity, so he was far behind his peers academically. But what he lacked in knowledge, he made up for in zeal. Before long he had secured a warrant to evangelize his former captors. Thus, Patrick returned to Ireland. He preached to the pagan tribes in the Irish language he had learned as a slave. His willingness to take the Gospel to the least likely and the least lovely people imaginable was met with extraordinary success. And that success would continue for over the course of nearly half a century of evangelization, church planting, and social reform. He would later write that God’s grace had so blessed his efforts that “many thousands were born again unto God.” Indeed, according to the early-church chronicler W. D. Killen: “There can be no reasonable doubt that Patrick preached the Gospel, that he was a most zealous and efficient evangelist, and that he is entitled to be called the Apostle of Ireland” (Ecclesiastical History of Ireland, London, 1875). We know that the kingdom of heaven belongs to “those who have been persecuted for the sake of righteousness” (Matt. 5:10) and that great “blessings” and “rewards” eventually await those who have been “insulted,” “slandered,” and “sore vexed” who nevertheless persevere in their high callings (Matt. 5:12–13). We know that often it is in “afflictions, hardships, calamities, beatings, imprisonments, tumults, labors, sleeplessness, and hunger” (2 Cor. 6:4–5) that our real mettle is proven. Nevertheless, we often forget that these things are not simply to be endured. They actually frame our greatest calling. They lay the foundations for our most effective ministries. It is when, like Patrick, we come to love God’s enemies and ours that we are set free for great effectiveness. Jesus said, “Bless those who curse you, do good to those who hate you and pray for those who persecute you (Matt. 5:44); and again, “Love your enemies, do good to those who hate you.” (Luke 6:27). Therein is the missionary impulse. Patrick’s life provides us with a stunning reminder of that remarkable Gospel paradox.